The Holy Father described the Christian life as a continual seeking after the Face of Christ. “It is thy face, O Lord, that I seek; hide not thy face from me” (Ps 26:8-9). 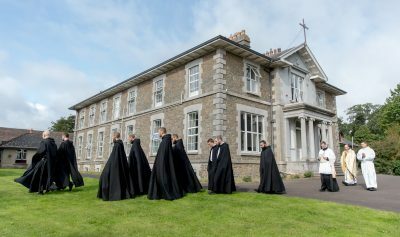 Addressing the many priests present, he invited them to open themselves to the imprint of the holiness of the Face of Christ. We will have occasion to return to the Holy Father’s discourse and to learn from it. For the moment, let us turn our hearts to the Word of God given us by the liturgy today; it too opens onto the mystery of the Holy Face. When Saint Paul speaks to us in today’s First Reading of “the word of the Cross” (1 Cor 1:18), he is referring not only to an event, and not only to a message. The Verbum crucis is the mystery of Christ Himself who is the Word Crucified. One who contemplates the Holy Face of Jesus gazes upn the Word Crucified. 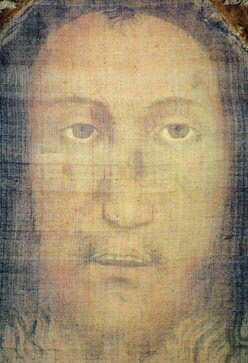 The image of the Holy Face of Manoppello draws us into the heart of the Paschal Mystery; it is an icon of the Word crucified, buried, and waking to the glory of the Father in the resurrection. If you would know “the power of God” (1 Cor 1:24), expose yourself to the Face of Christ. If you would know “the wisdom of God” (1 Cor 1:24), study the Face of Christ. The image of the Holy Face reveals that “the foolishness of God is wiser than men, and the weakness of God is stronger than men” (1 Cor 1:25). Those who look upon the Face of Jesus with a pure heart discover there “the secret and hidden wisdom of God” (1 Cor 2:7). “None of the rulers of this age understood this; for if they had, they would not have crucified the Lord of glory” (1 Cor 2:8). In the Gospel we see that the one desire of the virgins waiting in the night was to catch the first glimpse of the Bridegroom’s face. Our Lord invites us to be vigilant, to keep watch with lighted lamps and to feed their flame with the oil of a pure, adoring love, a love that consumes itself while waiting for the unfading light of His Holy Face. “Even the darkness is not dark to thee,” says the psalmist, “the night is bright as the day; for darkness is light with thee” (Ps 138:12). The Bridegroom comes in the mystery of the Most Holy Eucharist. The human face is the expression of a presence that is personal and real. The human face is the epiphany of the heart, and Christ Jesus is the Human Face of God. The Eucharist is the Human Face of God – His real presence – turned toward us to reveal the burning desire of His Heart: “With desire I have desired to eat this pasch with you, before I suffer” (Lk 22:15). Bring your lighted lamps – hearts aflame with faith, hope, and love – before the Blessed Sacrament today. The Bridegroom will make the light of His Eucharistic Face shine upon you. Last October 23rd in his homily for the canonization of Saint Gaetano Catanoso, Pope Benedict XVI quoted the humble priest of Calabria, saying: “If we wish to adore the real Face of Jesus, we can find it in the divine Eucharist, where with the Body and Blood of Jesus Christ, the Face of Our Lord is hidden under the white veil of the Host.” In every Mass we should want to cry out, “Behold, the Bridegroom comes! Go forth to meet him!” (Mt 25:6). Do this today. Go before the Eucharistic Face of Jesus, substituting yourselves there for those who do not know where to seek His Face, for those who do not know how to seek His Face. Expose yourselves to the radiance of the Eucharistic Face of Jesus for those who do not want to pray and for those who are afraid of prayer. For the sake of those who find no time to adore, be generous today in adoring Him whose Face is hidden beneath the sacramental veils. “Now we see in a mirror darkly, but then face to face” (1 Cor 13:12). Let not the Holy Father’s pilgrimage to the Holy Face of Manoppello be in vain: in the dark night of this world let us become “the generation of those who seek the Face of the God of Jacob” (Ps 23:6). “Behold, the Bridegroom comes! Go forth to meet him!” (Mt 25:6). Thank you for blogging! It’s stunningly beautiful so far! This post, like so many others, stokes the fires of desire. Thank you.